The rotor is the heart of a wind power plant. It converts wind energy into mechanical energy and is therefore a fundamental part of a wind turbine. The rotor blades are constantly exposed to enormous stress. During transport, the construction and during the actual operation of the wind turbine, damages may occur, which affect the performance/ output of your wind power plant. Also production defects can become visible during operation. VERTEC Solutions detects defects and damages on your rotor blade early with special inspections and repairs damages using the latest techniques in blade construction and composite technology. During a rotor blade inspection the exterior and interior of the blades are subject to a non-invasive visual and knock test. Such inspections comprise the blade shells, the bonds, any attachments, the drainage holes and the lightning protection system. A high level of expertise and experience are needed to not only identify damages, but also to classify them. VERTEC Solutions checks your blades for possible defects and deviations such as cracks, delamination, erosion, surface defects, damages to the attachments etc. and documents the present status of your blades in a comprehensive report. We conduct factory acceptance tests and check the blades for commissioning. Thanks to the use of rope access, drones or special camaras we can even check your rotor blades during operation – prior to the expiration of the warranty or for periodic inspection, control, regardless of the height of the wind turbine and the size of the blades. 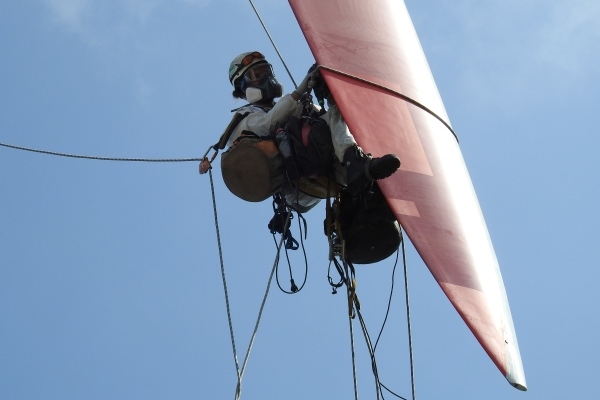 The inspections and repairs of rotor blades follow the principles of BWE, and DGUV “Information 203-007: Wind Turbines”. Rope access technican on wind energy turbine hub. In addition to the inspection and assessment of rotor blades, VERTEC Solutions core business includes the professional repair of rotor blades. We repair typical surface damage such as cavities, flaking, pinholes and surface scratches as well as damages to the laminate through cracks, lightning strikes and erosion. All repairs follow the manufacturer’s instructions, the valid DIN standards according to standards for the processing of glass fiber reinforced polyester resin and epoxy resin and the technical regulations of DVS in compliance with the safety and environmental protection regulations. Moreover, our emergency response team carries out emergency repairs to ensure the fastest possible commissioning of the plant in poor weather conditions. Our engineers have extensive knowledge and years of experience with fiber composites and get regular training on the latest innovations and technologies.